Avian Circovirus, also known as Psittacine Beak and Feather Disease (PBFD), is a viral disease that affects parrots and cockatoos. Different strains of avian circovirus can cause disease in pigeons and passerines (such as canaries and finches). The virus does not affect humans. It is sometimes referred to as an ‘avian AIDs virus’ because it attacks the immune system and leaves birds susceptible to other disease agents, such as bacteria and fungi. The virus is resistant to many disinfectants and is long lived in the environment, for example, it can withstand freezing and can remain in nest boxes from year to year infecting successive clutches of nestlings. In cockatoos, the most common form of PBFD causes stunted, deformed, broken and brittle feathers as well as brittle, blackened, eroded and overgrown beaks and claws. In the early stages of the disease the powder down feathers on the hips are often the first to show abnormalities. If your cockatoo’s feathers seem dirty and there is no power down on your hands after you handle your bird, this could be a sign of PBFD. 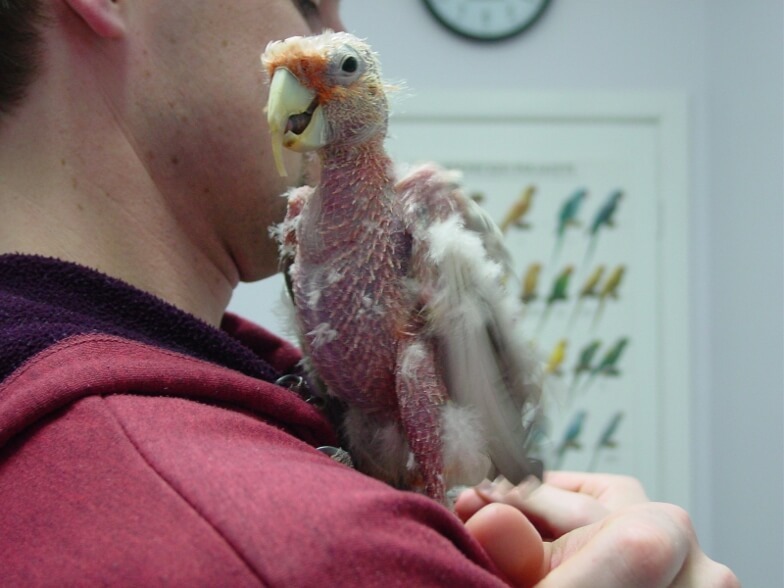 The development of further feather abnormalities depends on when in the moult cycle the virus first took hold. Newly moulted feathers will show stunting and deformities as they emerge. Even feathers on the head and crest, where a feather-picking bird would not be able to chew and damage them, can be affected. Picture : Some Beak and feather birds live over 30 Years Like out Barney Here. While PBFD can sometimes cause acute death in young birds, more often it develops as a chronic debilitating disease. Secondary infections with bacteria or fungi can cause general illness or separation of the layers of the beak. In severe cases the beak may peel away from the bone. If the beak is not badly affected, some birds can survive for years with PBFD but they continue to shed the virus in their droppings and feather dander. One patient at our clinic had the disease for over 40 years and while he had hardly any feathers, his quality of life was good. Unfortunately, more frequently, as the disease progresses quality of life deteriorates and the bird succumbs to secondary problems. 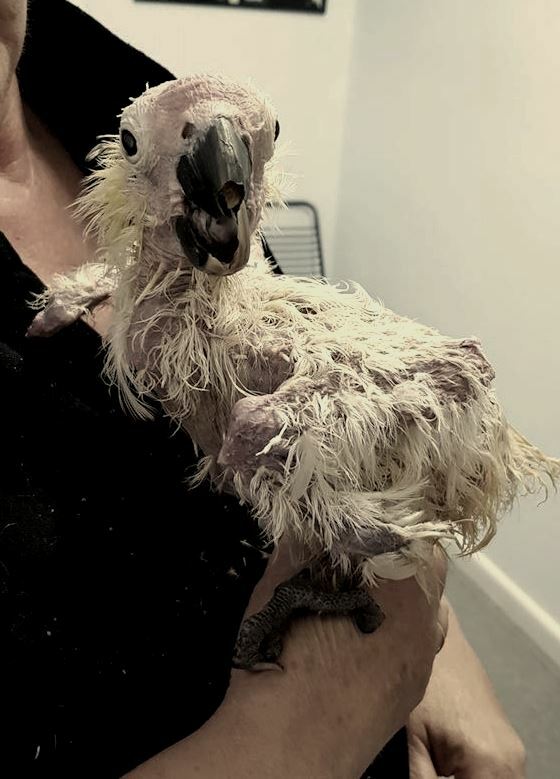 Given the poor long term outlook with badly affected cockatoos, some owners, quite reasonably, elect euthanasia as in the best interests of their pet. Other owners, equally reasonably, elect to preserve. Circovirus is generally not as severe in parrots as it is in cockatoos but it may still be a debilitating and fatal disease. The beaks and claws of parrots are usually not affected but poor feathering may occur on any part of the body. The primary and secondary wing feathers may be stunted so that birds are unable to fly. These birds are called ‘runners’. In budgerigars the condition has been called ‘French Moult’. The disease is widespread in wild Rainbow Lorikeet populations with affected juveniles presenting as ‘runners’. Unlike with cockatoos, these young lorikeets may grow normal feathers on subsequent moults and can return to normal. However, they still continue to shed the virus and present a risk to other birds. Cockatoos with advanced PBFD have characteristic beak and feather changes and diagnosis can be strongly suspected based on physical examination by an experienced avian veterinarian. Laboratory tests are, however, needed for confirmation. This is particularly so in early cases or with species other than cockatoos where diagnosis may not be straight forward. Typically, testing blood or feathers for the presence of circovirus genetic material using a PCR test as well as a test on the blood to check for antibodies to the virus will be advised. There are no drugs that have been clinically proven to cure PBFD once a bird has begun to show obvious clinical signs. Some birds may be helped with drugs to improve the immune system; lifestyle changes; anti-viral drugs that have a partial effect against circovirus and other drugs to address any secondary infections. Self-cure sometimes occurs in lorikeets but is rare in other species once obvious clinical signs have appeared. Affected birds are known to continue to shed the virus, so can be infectious to other birds. Circovirus can last many months outside the bird and is resistant to many commonly used disinfectants. Your avian veterinarian can advise you as to the current best treatment and prevention options for your individual bird and circumstances. Why hasn’t a vaccine been developed against PBFD? This is a complicated story. A vaccine has been developed against PBFD but, like most vaccines, it is not effective if a bird has already been exposed to virus. 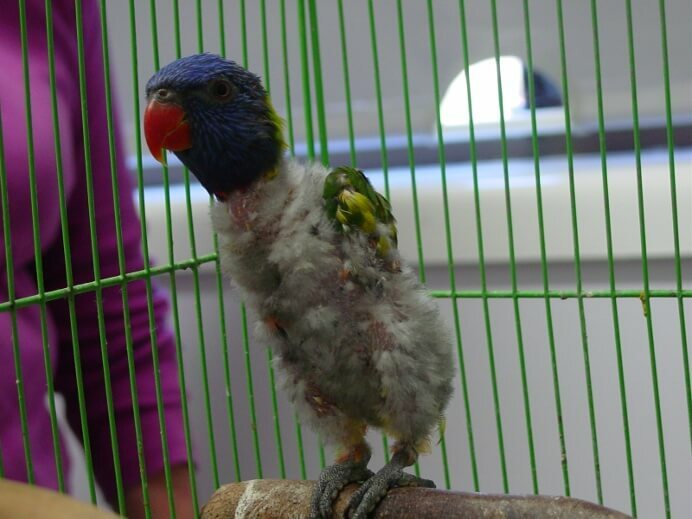 This disease is widespread in Australia’s wild bird populations and in pet shops so many birds have been exposed to the virus, most develop resistance to it but some harbor the virus for many months before they show obvious symptoms. The vaccine, while available experimentally, has not been released because it does not prevent the disease developing in these apparently normal but already exposed birds. If birds are vaccinated when they are already carrying the virus, then show disease after vaccination, complaints would be unavoidable. Research is continuing.